I want to preface this by saying we’ve all made bad takes. Whether it’s going after a particular player in the trade market, signing a free agent or line combinations, we’ve all said something outlandish. Last night we might’ve heard one of the more incredible trade suggestions of the season — maybe of the decade. During the first intermission of the Los Angles Kings versus New York Rangers broadcast on Fox, All The Kings Men podcaster Jesse Cohen joined the show. If you missed it or haven’t seen the clip that is in the process of going semi-viral, here’s the scoop. 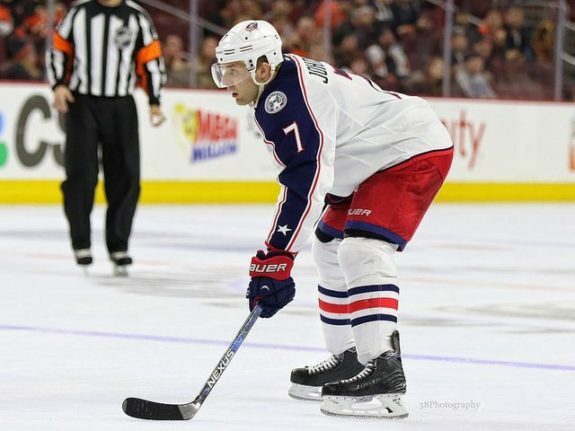 Cohen had an interesting, very far-fetched idea involving the Edmonton Oilers and Columbus Blue Jackets defenseman Jack Johnson. The 31-year-old is in the final year of his deal and is a pending unrestricted free agent this summer. 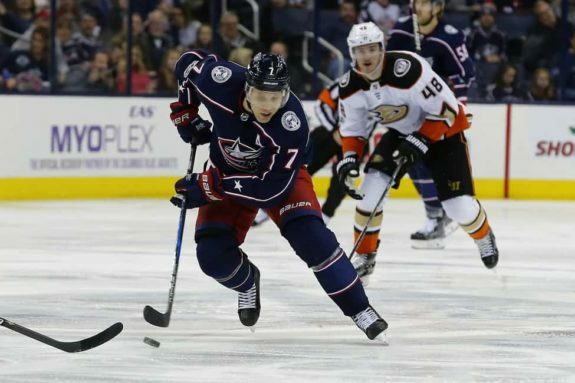 Johnson also recently asked the Blue Jackets to trade him . Ignore the shot at Johnson’s personal financial situation. That’s neither here nor there. If we look at Johnson as a player alone, yes he’s had a tough year with just seven points in 47 games. He’s also not generating shots from the backend as he did a year ago. That said, Cohen might be off the mark on a few things. Admittedly, I’m not a Blue Jackets expert, but this is what I found. Johnson is not playing third-pairing minutes for Columbus. In fact, he’s playing the fourth-most minutes on their defense with 19:30, which puts him behind Seth Jones, Zack Werenski and David Savard. Daily Faceoff shows that Johnson’s playing on the second-pairing with David Savard. The Blue Jackets are rolling with just three defensemen (Werenski, Jones and Markus Nutivaara) on their power play. That partly explains why Johnson’s minutes have dipped from last year. Johnson is still seen as an integral member of the Blue Jackets backend. Comments made by head coach John Tortorella suggest how valuable he’d be during the second-half of the season. In the past five of six games, Johnson hasn’t played well, and his minutes were cut because of that. However, in his last game, he was back to playing 22:08. Against the Dallas Stars, Johnson played the third-most amount of shifts of his season with 30. Is it showcasing? Is it a vote of confidence from his coach? Either way, Johnson had a solid game all around. But let’s continue with the Cohen take. So my solution is to trade him to the Edmonton Oilers who are now without Ryan Nugent-Hopkins for five to six weeks. They’re floundering, they’re season is at risk of missinig the playoffs, and not finishing at the bottom of the league to get that top draft pick. Take a minute to let that settle in. It seems like so many mainstream media, analysts and hockey people outside of Edmonton use that McDavid logic for trade talk. Know a player that’s struggling? Trade him to Edmonton and play him with No. 97. However, this must be the first time it’s been suggested that a defenseman be his linemate. Even then, a defenseman who’s best offensive years are behind him. Now if Johnson had been a guy who plays forward at times, like Brent Burns, sure maybe it wouldn’t seem as illogical. Twitter had a field day with this take. Oilersnation’s Matt Henderson suggests poor takes like this are because of Edmonton’s recent trade history and a lack of respect among the media. The rest of the feed on this topic is laughter among Oiler fans. What would the Oilers even give up for this random experiment? I’m not convinced Cohen was seriously suggesting Edmonton trades Ryan Nugent-Hopkins for Johnson. Related: Oilers Need a Scorer, But Who? For what it’s worth Cohen has replied to Nation Dan for all the backlash he received, and is prepared for the barbs. I'm well prepared for the repercussions of bad takes. A few weeks ago I used my time to bad mouth Avocados. Cohen’s been a good sport after how his thoughts were received by fans, more specifically Oiler fans. They weren’t the only ones who noticed the lack of logic and sound-mindedness behind this take. Cohen’s broadcast colleague, Patrick O’Neal, chimed in at the end of the segment. In the spirit of this, drop your crazy trade suggestions in the comments below.